Tag line: "The world's tallest building is on fire. 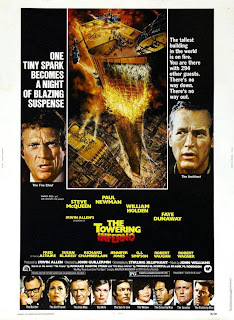 You are there on the 135th floor... no way down... no way out"
As much as I love The Poseidon Adventure, 1974’s The Towering Inferno is easily my favorite of the ‘70s disaster films. 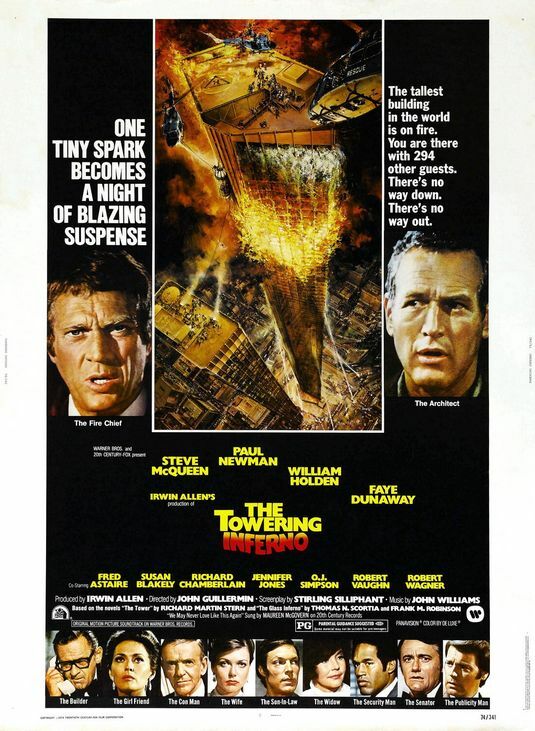 Featuring a bevy of stars fighting for their lives inside a burning skyscraper, The Towering Inferno packs action, excitement, and a whole lot of fun into 165 minutes. It’s opening night for San Francisco’s Glass Tower, the world’s tallest building, and on-hand to celebrate is its designer, architect Doug Roberts (Paul Newman). After doing a bit of research, Roberts finds that Roger Simmons (Richard Chamberlain), the electrical engineer and son-in-law of the building’s owner, James Duncan (William Holden), cut corners when installing the Tower’s electrical supply, thus putting the entire structure in danger. Ignoring Roberts’ warnings of impending doom, Duncan decides to go ahead with the dedication ceremony, set to take place on the 135th floor. But when a small fire breaks out on one of the lower levels, it leads to an all-out blaze that threatens not only the Tower, but also the lives of everyone inside. With the help of Chief Michael O’Halloran (Steve McQueen) of the San Francisco Fire Department, Roberts works to save as many people as he can, a task that grows increasingly difficult when the fire spreads to the other floors. Part of what makes The Towering Inferno the “granddaddy of disaster films” is its phenomenal cast. Along with Newman and McQueen, both of whom were big box-office draws at the time, there’s William Holden, giving a strong performance as the owner who quickly sees the error of his ways, and Faye Dunaway as Susan, the girlfriend of Paul Newman’s character who ends up trapped in the building right along with him. Other employees of the Glass Tower include Dan Bigelow (Robert Wagner), the building’s public relations chief and one of the first to be cornered by the fire (his attempt to escape the blaze is perhaps the film’s most poignant moment), and Security Officer Harry Jernigan (O.J. Simpson), who works with Roberts to get as many people to safety as he can (including young Mike Lookinland, who also played Bobby Brady in the T.V. series The Brady Bunch). As far as the guests are concerned, there are local dignitaries like Senator Parker (Robert Vaughn), as well as Harlee Claiborne (Fred Astaire), a con man trying to bilk lonely widow Lisolette Mueller (Jennifer Jones) out of some of her money. Even singer Maureen McGovern, whose tune “The Morning After” became a hit when it was featured in The Poseidon Adventure, shows up, playing herself and entertaining the guests on the 135th floor. With a number of tense rescues and a finale that’s out of this world, The Towering Inferno set the bar high for every disaster film that followed. And in my opinion, none ever came close to it. I think what also made this film great was not just the cast but the interaction of the cast as their characters. Specifically, Steve McQueen's resentment towards Paul Newman and their long going competition. You can see it come out on screen. I still like the 'Poseidon Adventure' more. Perhaps it has to do with the fact that I liked to see Gene Hackman & Ernest Borgnine go at it. Besides, Shelly Winters sacrifice, was a real tearjerker.